As this was my first time visiting Naha City and didn’t know any izakaya (Japanese-style pub) or restaurant at all, I looked for one in Naha City using Tabelog, a Japanese popular gourmet website, and found a popular izakaya called “Shunsaidokoro Bidoro” near my hotel. It ranks first in the Tabelog ranking of izakayas in Naha City as of January 2017. Bidoro is located in Makishi, Naha City, on a low-traffic road connects to Prefectural Road 222 which intersects with Kokusai-dori (International Street), so it may be a bit difficult to find this izakaya especially if you visit Naha City for the first time. Bidoro is a compact izakaya with 14 seats, and as it is one of the most popular izakayas in Naha City, it is usually crowded during early evening hours. I dined at this izakaya twice while staying in Naha City for about a week, it was filled with customers on each day although I visited at around 9:00 p.m. (after dinner time). So, prior booking is necessary if you want to dine at this izakaya during dinner time. I sat at the counter, ordered Orion Beer and ate “jimami tofu (tofu made by using peanuts)” which was served with the beer. I became addicted to the chewy texture and mild taste of jimami tofu. They have typical Okinawan dishes as well as original dishes using ingredients from all over Japan. 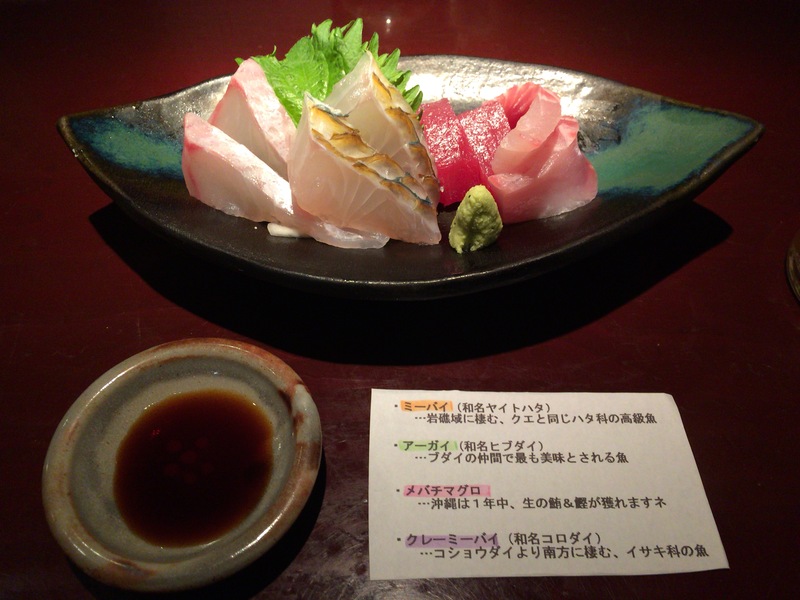 One of the recommendations is “assorted sashimi (sliced raw fish),” which consists of various fish from Okinawa. It comes with a paper explaining about each fish (written in Japanese, though). My favorite was “agai (blue-barred parrotfish),” although its appearance didn’t look good. And also, I tried “rafte (simmered pork belly)” with traditional miso flavor for the first time, and it was awesome. I ordered “mozuku tempura (deep-fried seaweed)” and “dashi-maki tamago (Japanese style omelet)” as well, and as I dined at this izakaya alone, they were kind enough to serve them in smaller potions. This is a great service as when visiting an izakaya alone, my stomach will soon be filled with a couple of dishes although I want to try various local dishes. Other dishes I ate were an original pasta using Okinawa soba noodle, boiled white fish and shima tofu (island tofu) with salt, etc. Lastly, I ordered Ishigaki beef (from Ishigaki Island of Okinawa) steak with rice, as I hadn’t eaten steak, which is one of the most popular foods in Okinawa, since coming to Naha yet. Beef steak or Okinawa soba noodle are the ideal foods to finish off the day while in Okinawa. I was very satisfied as all dishes were delicious and the prices were reasonable. I was obsessed with eating delicious foods in a relaxed atmosphere, so I ended up having only a couple of drinks (mostly beer), but it seems that they have a wide variety of Japanese sake and Awamori (Okinawan shochu). Bidoro is managed by a married couple, and they sometimes talked to me while I ate alone at the counter. The husband (chef) looks kind and his wife is very friendly, and they look a happy couple. It may be one of the reasons why Bidoro is so popular that the distance between them and customers is close, and therefore customers can feel a relaxed atmosphere as if in their own homes. Late at night, a customer started to play sanshin (Okinawan three-stringed banjo) in the izakaya. True to its reputation, I was satisfied with the dishes, atmosphere, and the personality of the owners. I will definitely visit Bidoro again if I come to Naha next time. The only thing I’m not satisfied with Bidoro is that there are often no seats left as it is quite popular among locals and tourists as well, and they don’t have many seats to begin with. So, I’m going to visit Bidoro again secretly late at night (maybe after 9:00 or 10:00 p.m.). After a dinner, they served me a hot tea and a snack. Gochisosama deshita (thank you for the treat).